Apple on Thursday announced updated MacBook Pro 13- and 15-inch notebooks with a Touch Bar, 8th-generation Intel Core processors, support for up to 32 GB of DDR memory in the larger notebook, a True Tone display, and an improved third-generation keyboard for quiet typing. The 15-inch model comes with 6-core Intel Core i7 and i9 processors rated at up to 2.9 GHz — with Turbo Boost, up to 4.8 GHz. It offers up to 4 TB of SSD storage. The 13-inch model has quad-core Intel Core i5 and i7 processors rated at up to 2.7GHz — with Turbo Boost up to 4.5 GHz. IT has double the eDRAM of its predecessors and up to 2 TB of SSD storage. SSD read speeds are up to 3.2GB/second. Both new MacBook Pros have up to 10 hours of battery life. 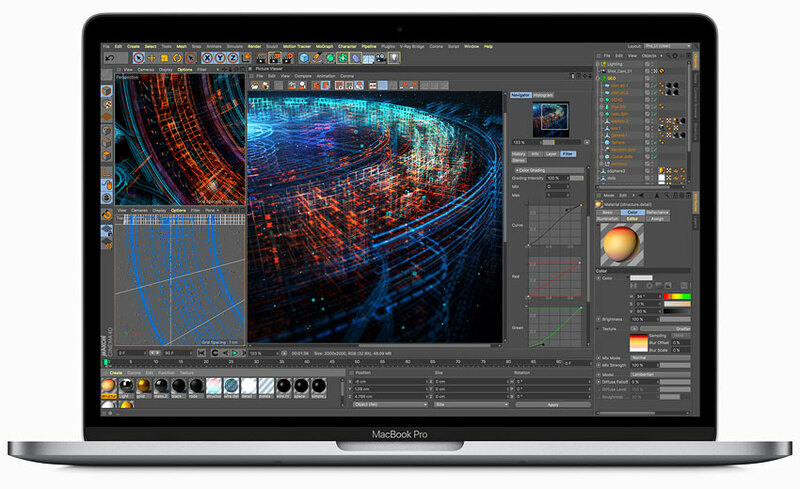 The new MacBook Pro delivers a speed boost for complex simulations and data manipulation. “The processor and RAM upgrades are crucial to keeping up with competitors on very premium devices like this,” said Eric Smith, director of tablet and touchscreen strategies at Strategy Analytics. “HP, Microsoft, and even Huawei have all made hay of how much more power their premium laptops have over Apple,” he told TechNewsWorld. Other features include an AMD Radeon Pro graphics card in the 15-inch MacBook Pro, as well as Touch ID, dynamic stereo speakers, and up to four Thunderbolt 3 ports. The True Tone screen technology, rated at 500 Nits, supports the P3 wide color gamut, as do the iPhone 7 and iMac Pro. “The TrueTone display is a nice touch for people who sit in front of their screens for hours on end — particularly for creatives, who really strain their eyes with their work,” Smith noted. Both update notebooks have Apple’s T2 chip, which debuted in the iMac Pro desktop earlier this year. The T2 supports secure boot and on-the-fly encrypted storage for greater security. It also enables the Siri voice assistant. “The real-time encryption makes it easier to protect your data,” said Kevin Krewell, principal analyst at Tirias Research. “I don’t think the Siri aspect is all that important, but it does level the field with Microsoft’s Cortana support,” he told TechNewsWorld. The processors aren’t new. Apple began using AMD Radeon in 15-inch MacBook Pros back in 2016, and the T2 processor in the iMac Pro desktop released earlier this year. MacBook Pros released in 2016 had Thunderbolt 3 ports. “There’s a lot of pent-up demand out there for an updated MacBook Pro, but there’s also been evidence of Mac users defecting to Windows machines in recent years,” Smith said. The updates “will give Mac sales a little boost over the next year,” he said. The new MacBook Pros are featured in Apple’s Back to School promotion, which launched Thursday. Purchasers will get educational pricing for the Mac, iPad Pro, AppleCare, select accessories, and a pair of qualifying Beats headphones free with the purchase of any eligible Mac or iPad Pro. The updated 13-inch MacBook Pro starts at US$1,800 and the updated 15-inch model at $2,400. Both are available at Apple.com, and at select Apple Stores and Apple Authorized Resellers. A maxed-out 15-inch updated MacBook Pro costs $6,700, according to AppleInsider. The most interesting part of this announcement “was the extension of [Apple’s] portfolio upwards with more build-to-configuration options,” observed Linn Huang, research director at IDC. “This is less about competing with a performance desktop market, and more about Apple tapping into the rapidly growing mobile workstation market, which grew more than 19 percent annually over the past two years,” he told TechNewsWorld. “The $7,000 i9 behemoth is less about moving a typical current MacBook Pro owner up the stack than it is about luring, for example, the Dell Precision Mobile Workstation user back to Apple,” Huang said. The iPhone is Apple’s main revenue generator, so whether Apple will remain committed to the MacBook is a question “only a few in Cupertino can answer,” he remarked.